For the fifth month in a row, the Conference Board Employment Trends Index (ETI) increased in February to 101.7, up from 100.1 in January. The ETI has improved by more than 8 percent from a year ago (see blue line in chart above). 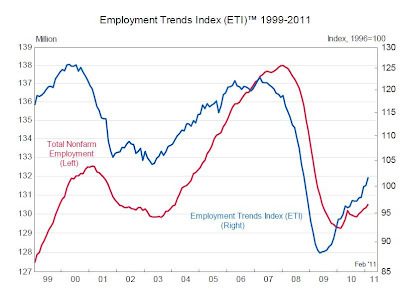 The Employment Trends Index is a composite index based on eight individual labor-market indicators. February's increase in the ETI was driven by positive contributions from seven out of the eight components: Consumer Confidence “Jobs Hard to Get,” Initial Claims for Unemployment Insurance, Percentage of Firms With Positions Not Able to Fill Right Now, Number of Temporary Employees, Part-Time Workers for Economic Reasons, Industrial Production and Real Manufacturing and Trade Sales. MP: The Employment Trends Index has been an accurate leading indicator of trends in payroll employment back to 1973. The ongoing gains in the index and the 15-point gain since mid-2009 indicate that we can look for gradual, but ongoing improvements in payroll employment levels in the months ahead. 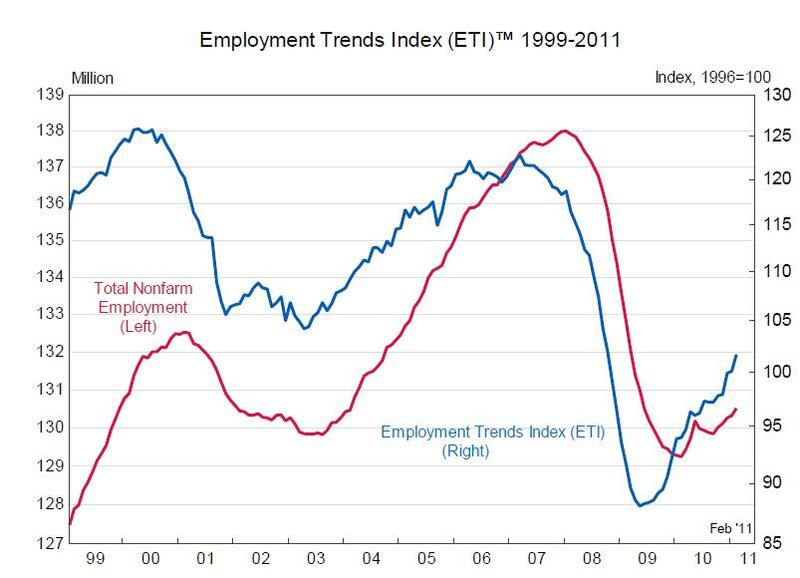 I'm glad to see the index increasing and more importantly that total employment is increasing again. The fact that total employment in the United States is lower today than in 2000 is still a very bad sign. i'm just eyeballing this, but it looks to me like this payroll recovery is lagging much further behind this index than in previous moves. there seems to generally be about a 1 year lag from ETI inflections and those of payroll. however, the movement in payrolls in this recovery seems far less in proportion to the ETI index from last recession or the responsiveness on the downside in the past 2 recessions. i don't have the actual data to run sensitivities, but eyeballing roughly, ETI bottomed at 105 in 2002 then ran up 115 over 2 years while around 3 million jobs were created. thus, a 9.5% index move drove a 2.3% increase on payrolls. this time we saw an index move from 87 to 102 in 2 years (+17.2%) and payrolls increase 1.4mn (1.1%). so, sensitivity in the 2 years after trough looks to have dropped from .24 to .06, a 75% decrease. that seems a very dramatic divergence and makes this indicator look less predictive than in the past. i'd be interested to see the sensitivity in other severe recessions (like 82). We still need pro-growth policies that will reduce the unemployment rate faster. "...there will be a $2.9 trillion gap between what the economy could produce and what it will actually produce (over four years; 2008-2009-2010-2011, based on real output)." Will the U.S. recover lost output and jobs? "Real GDP needs to grow at 5.2 percent (per year) from now (2011) to 2015, to achieve this result (close the output gap)." my god, krugman has become such a worthless political shill. opportunity cost is not the same as "losing wealth". only working 40 hours when you could have worked 50 is also not "losing wealth" it's a missed opportunity. these are such simple economic concepts that there is no way krugman does not understand them. he has traded every once of integrity and economic rigor he ever possessed for celebrity and political agenda. he is nothing more than a shill now. i'm not sure if it's sad or disgusting, but it certainly one of the two. Morganovich, the opportunity cost is gaining leisure and giving up labor. You could view leisure as wealth. Nonetheless, the U.S. is underproducing by a large margin. The country is not even close to full employment (e.g. 40 hours a week). Normally, actual output is roughly equal to potential output (e.g. in the mid-2000s), and sometimes actual output exceeds potential output (e.g. in the late-1990s). However, the output gap (where actual output is below potential output) hasn't been this large for this long since the Great Depression, and it looks like it'll close slowly. "i'm not sure if it's sad or disgusting, but it certainly one of the two." In my opinion it's both. For some reason, a lot of people follow Krugman and seem to trust him. The misinformation he provides does them a great disservice, and makes things harder for all of us, as some of those people influence policies that affect everyone.